Includes industry commentary, reports and latest happenings in the CRM Lead Management market sector. 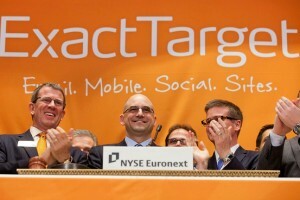 This article was posted as a Guest Blog Post relating to Salesforce.com. 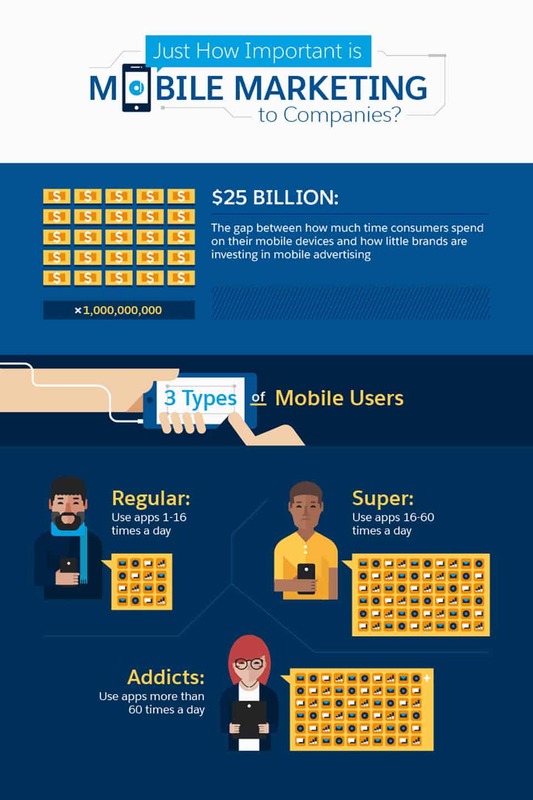 There are different types of mobile users—regular, super, addicts, all of whom can be affected by mobile marketing in some way. How you reach them depends in part on the individual setups they have—push notifications, for example. Of course, push notifications equals more times opening an app. But push notifications can’t and shouldn’t be random. They should be designed to create an experience and action, as should SMS marketing. The majority of customers wouldn’t mind more contact from brands using SMS marketing. Those messages get the attention of customers in a crowded world, and they often result in very quick review of a message. There is a great gap between how much time we spend on our phones, and how much (or little) companies are investing in mobile advertising. How can you make your mobile marketing work harder and smarter? To learn more about the potential in mobile marketing and the various ways to engage customers, check out Marketing Cloud’s article Mobile Marketing Examples to Energize Your 2016 Campaigns. The marketing automation software market size was approximately $750M in sales revenue last year (2013), which represents an astounding growth of 50% year over year for the past several years. By the end of 2014, the market is expected to grow to $1.2B, 60% year over year. According to IDC, marketing automation will be growing faster than any other CRM segment over the next three years. Gartner finds marketing automation will lead CRM application segment growth with a 10.7% compound annual growth (CAGR) through 2016, reaching a total market value of $4.6B. A research study performed by the University of Dallas, Satish & Yasmin Gupta College of Business, called the Marketing Automation Software Competitive Analysis Report, revealed that smaller marketing automation providers offer the same amount of features to small to medium sized businesses as larger competitors. Their offerings prove to be advantageous to small companies looking to save money and increase reach to potential leads. The study compares four companies, Act-On, SharpSpring, eTrigue and Lead Liaison. The companies were chosen because they specialize in offering marketing automation solutions to small to medium sized businesses. Standard offerings for marketing automation software include email, social media, search engine optimization, blogging tools and CRM integration. Act-On is considered a leader in the market by its competitors as they offer a full package for automation software and have been used by departments in larger organizations. The study found that Lead Liaison, a marketing automation upstart in Allen, TX, offers almost all the same capabilities as the leaders in the market and provides distinct advantages to small to mid sized businesses. A rich and easy to use interface, comprehensive lead qualification, and a multi-channel communication engine that sends email, text messages, direct mail and other physical marketing items standout as superior capabilities. 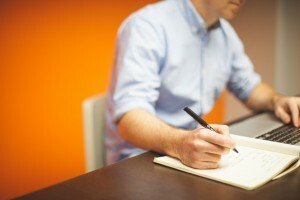 The research study also revealed unique services tailored for small businesses, such as content creation, where Lead Liaison offers businesses a portal to generate marketing and leadership content for SEO purposes – necessary for small business with resource constraints. Act-On and Lead Liaison offer flexible payment plans including an offering on a monthly basis. This provides small companies with tight budgets the flexibility to manage cash flow and reduced risk by knowing they don’t have to commit to a contract for several years. These platforms are valuable to the small to mid sized market as they help attract customers and increase sales and awareness. The research study also offers guidance on what small businesses should consider before choosing a marketing automation solution. Some areas of consideration are; update your CRM data, dedicate time for training, develop a sales and marketing process, develop content to provide to customers and prospects, and understand how others have implemented marketing automation. Please feel free to download the report published on 1/21/2015. Learn more about Lead Liaison’s solution for marketing automation for universities and education providers. Lead Liaison provides cloud-based marketing and sales automation solutions that help businesses worldwide attract, convert, and close leads. The company markets to small to mid-sized businesses and focuses on providing a user-friendly and innovative Revenue Generation Software® platform. Their software delivers powerful solutions that accelerate sales, improve efficiency and build stronger relationships with prospects, customers and partners through the use of automation. The University of Dallas is a co-educational, Catholic university founded in 1956. Our students are enrolled in undergraduate, graduate and continuing education programs through the Constantin College of Liberal Arts, the Satish & Yasmin Gupta College of Business, the Braniff Graduate School of Liberal Arts, the School of Ministry and the Center for Professional Development. The University of Dallas has its main campus in Irving, Texas, and an international campus near Rome, Italy. The main campus, in Irving, is only minutes from downtown Dallas in a city of 200,000 residents. The campus is an oasis of nature in the center of Metroplex, on 225 rolling acres that overlook both the Las Colinas Urban Center and the skyscrapers of Dallas. The University of Dallas is about 10 miles from the Dallas-Fort Worth International Airport. 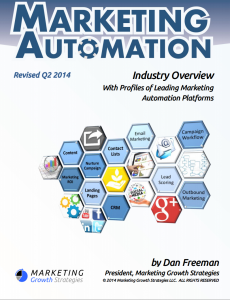 Texas-based marketing automation company Lead Liaison was recently featured in Marketing Growth Strategy’s 2014 Marketing Automation industry report. This publication covers the top companies in the marketing automation vertical and profiles size, featured products and relevant contact information. The report highlights Lead Liaison’s ‘impressive user interface’, business model and consistent growth since inception. Lead Liaison’s robust marketing features and support capabilities are also highlighted. Screenshots from the Lead Liaison interface demonstrate the platform’s flexibility and user-friendliness. With the addition of even more helpful features to its interface and industry-wide recognition as an increasingly strong leader in the marketing automation space, Lead Liaison is set for more success and notability throughout the remainder of 2014. Are you a numbers person? Do you want figures that show how lead management through marketing automation actually provides better results? 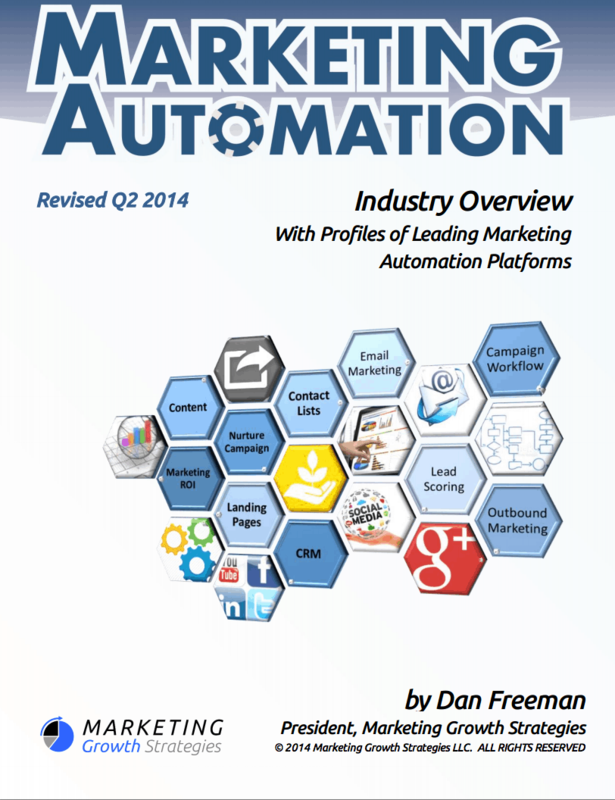 Take a look at these marketing automation and lead management statistics. 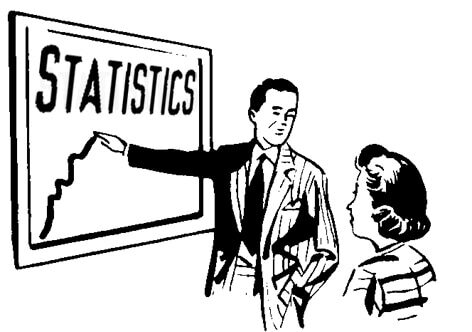 What marketing automation statistics do you have to share? 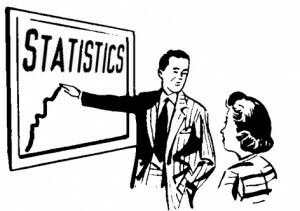 As more companies adopt lead management through marketing automation, there will be more statistics to share! The B2B marketing automation space has established itself as one of the most vibrant industries in the United States. Recent activity, including a $78 million Marketo IPO, a $100 acquisition of Pardot by ExactTarget, a $871 million acquisition of Eloqua by Oracle, and a $25 million venture funding of Silverpop, suggests the marketing automation industry is growing at a breakneck pace. Marketing automation has become the bellwether of online marketing for B to B marketers. Companies in business-to-business industries from IT consulting to manufacturing have been adopting lead generation and management applications at a furious rate since 2009. The industry is still in its infancy. 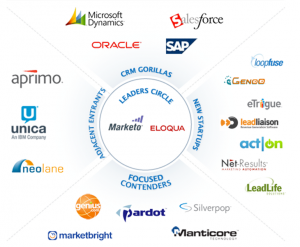 None of these big hitters is even 15 years-old: Eloqua and Silverpop were founded in 1999, Marketo and Pardot in 2007. 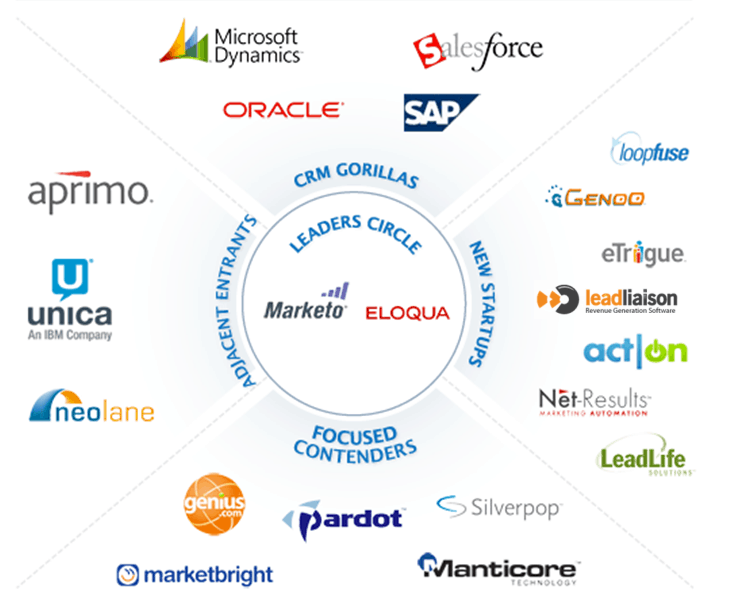 These marketing automation industry players are leading (in terms of capitalization) a group of smaller but no less effective MA vendors. For example, Lead Liaison’s Lead Management Automation™ cloud-based platform is a competitive lead management solution because it allows marketers to expand their email delivery without overage charges. There are several other examples of competitive advantages that smaller players have which MA vendors like HubSpot, Pardot, and LeadLander do not provide. Since 2005 digital marketing has grown substantially. PPC advertising, social media marketing, and SEO have all played a part in marketing B2B solutions. However, marketing automation software appears to have one important differentiator from other B to B digital marketing components: while buying behaviors may change (such as reduced PPC click-through), capturing and managing Big Data for marketing purposes is not vulnerable to changing online behavior trends. The function of marketing automation will remain viable for B to B companies for decades. Perhaps this is why companies like Marketo, Eloqua, and Lead Liaison are forging a sustainable path for this booming industry. Last week’s announcement of the $2.5 billion acquisition of ExactTarget by Salesforce.com had the marketing automation space buzzing – with good reason. Sales force optimization remains a key objective for most companies, and marketing automation is quickly asserting itself as a primary contributor to sales force effectiveness. Salesforce.com has long recognized the benefits in automating customer relationships, but the move last week confirms that the company views the marketing cycle as an important contributor to optimizing B-to-B sales force automation. 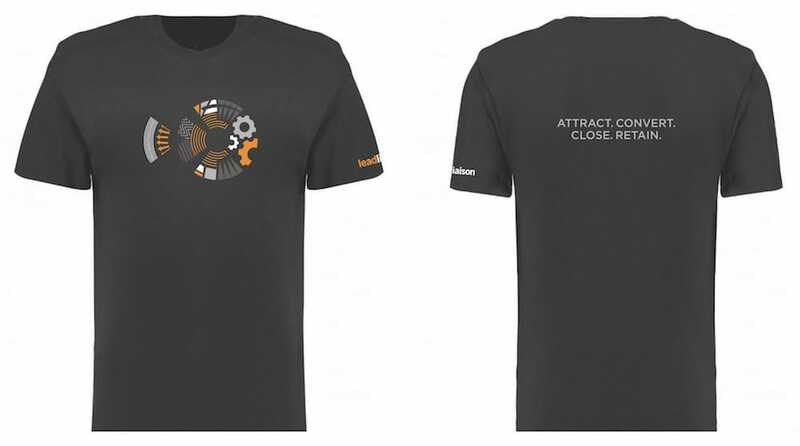 It’s clear Salesforce.com understands the power of marketing automation. Rare is the sale today that doesn’t start with a mouse-click. From the Pew Research Center to Gartner, study after study shows the marketplace, b2b or b2c, conducting online research prior to a purchase. Through its acquisition, Salesforce.com recognizes the benefit in tracking lead behavior from the first point of contact. Marketers understand that most prospects require multiple touch points to be effective. Using a marketing automation system like Lead Liaison’s Lead Management Automation™ platform, an enterprise sales force can manage each relationship prior to the sales engagement. Lead nurturing through MA saves sales agents time; Salesforce.com has shown that it understands how critical lead nurturing is to sales force optimization. Research has shown that just because a prospect doesn’t convert immediately into a sales opportunity, that prospect should remain a lead. Sirius Decisions found that nearly 80% of qualified leads that don’t buy initially go on to make a purchase within 24 months. Marketing automation provides the tool to maintain TOMA throughout that period. This factor, among others, has led vendors like Lead Liaison to focus on SFDC integration in order to provide a seamless transition between platforms. As MA becomes an integral part of sales force automation, companies like Salesforce.com, Marketo, and Lead Liaison must continue to improve their offerings to adapt to evolving marketing and sales practices. But as the evolution of marketing automation continues, one business principle remains constant: providing quality support following implementation is important to effective sales force automation. Without customer-centricity, some MA/CRM vendors may face the same fate as early dot.com failures – even in the wake of a $2.5 billion transaction. What is Gartner’s Magic Quadrant for Lead Management all about? Some high profile names such as Marketo, Eloqua, Microsoft, Oracle and Salesforce.com were mentioned. 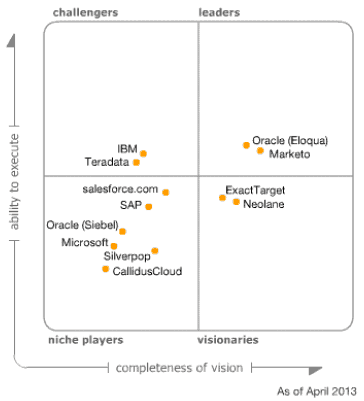 Lead Liaison was not in the Magic Quadrant for Lead Management, but that’s easily to explain. We’re still a relatively young company and have yet to clear the $20M revenue threshold that’s required to be part of the report. The future looks incredibly bright though as we’re blazing our own trail of innovation in the marketing automation industry. If you don’t have a copy of the lead management report we can give you a quick summary. Lead management integrates business process and technology to close the loop between marketing and sales and to drive higher-value opportunities through demand creation, execution and opportunity management. The input to lead management processes is unqualified contacts and opportunities from various marketing sources. The output to lead management processes is qualified, scored, nurtured, augmented and prioritized selling opportunities handed off to direct or indirect sales channels for action and closure. Investments in CRM marketing automation and applications and services (including lead management) grew by more than 20% in 2011 and 2012. Gartner expects investment to continue to rise during the next several years. This means more and more companies recognize the importance of marketing automation and lead management in particular because it does three primary things as described below. Marketing automation and lead management increases enterprise growth, attracts and retains new customers and maximizes productivity of sales organizations. Factors driving the growth of marketing automation and lead management are the overall growth and success of the CRM markets and investment in digital marketing. Recent M&A and IPO activities underscore market interest in this sector (Marketo IPO, Eloqua bought by Oracle, Pardot bought by ExactTarget). B2B marketers are adopting marketing channels normally used for B2C marketing such as social media. Focus on products or services that represent a sizable investment (also known as “considered purchases”). Businesses selling high-value products or services tend to get a higher return on their investment. A handoff of qualified leads to a direct salesperson or an indirect sales team (value-added reseller or distributor), an inside sales team, or an automated channel.